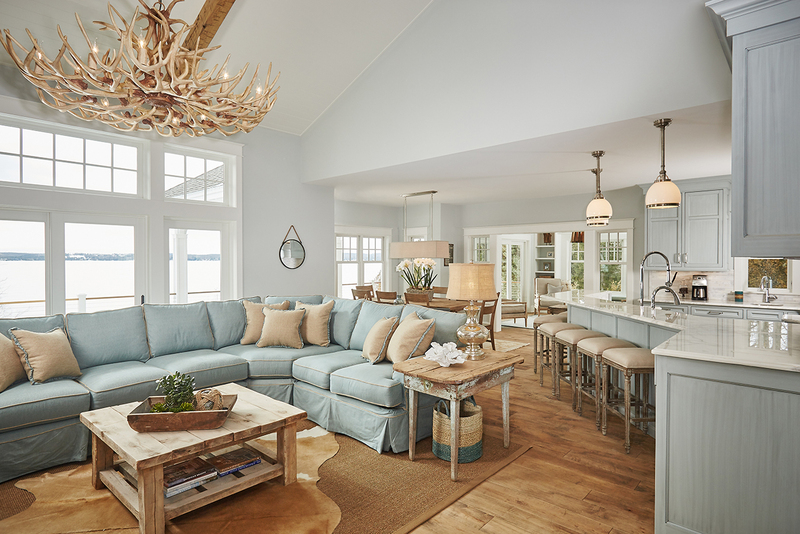 A Michigan home combines rustic glam and beachy style for a soft, airy look that transitions effortlessly to the colder seasons. Sunning in Style. The sunroom ties in beautifully with the great room, dinning room and kitchen, with its airy color palette and country-inspired details, like the light fixture and crate coffee table. At the same time, more sophisticated elements such as the upholstered chairs and window bench, add elegance and frame the gorgeous view just outside the windows. Forget everything you know about rustic and nautical style because the Michigan cottage on Lake Charlevoix breaks every design stereotype, making it a unique oasis of cozy style. Inspired by the getaway cottage that homeowner Trudy Haugan had grown up going to, Trudy and her husband Bob envisioned this home as a special place for yearly visits with their four teenage children. The cozy lake house cottage was built from scratch just two lots down from the family cottage Trudy vacationed in as a child. For its design, layout and styling, they turned to interior designer Amy Darooge, of Villa Décor. Amy embraced the couple’s rustic and nautical aesthetics, interpreting them with an airy aplomb that takes on a warm, mug-in-your-hand feel for fall. The Greatest of Rooms. Even though the great room, sunroom, dining room and kitchen are all part of one continuous space, subtle demarcations create separate spaces, like the arrangement of the sofa, the higher ceiling over the living room and the light fixtures in the kitchen and dining room. Petite Details. Textured lampshades mix with vintage details like a carefully curated stack of books, creating an interesting and romantic vibe. The living room is a stunning yet cozy space. High ceilings that give it a lofty feel and the room’s dimensions and picture windows are all perfect for the custom window seat and built-ins on either side. “You can nestle in with a book but also enjoy the million-dollar view,” Amy explains. And while guests appreciate all those elements, it’s the magnificent Restoration Hardware antler chandelier that commands the room. “The chandelier was a happy medium between rustic and bringing nature into the space,” Amy says. Its composition feels distinctly country and, during the fall, inspires thoughts of the woods, while its bleached hue is unexpectedly light and beachy. Amy executed a similar feel underfoot with layered rugs and a custom coffee table. 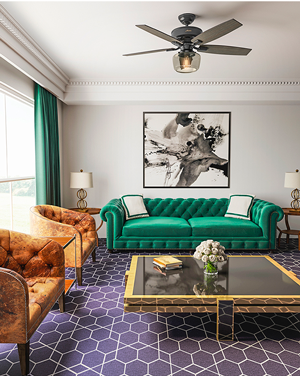 In order to balance the room’s colors, she placed a sisal rug on the floor and positioned a silky soft cowhide on top. Then she added the coffee table, which had been custom designed to look like driftwood, artfully blending the nautical and rustic themes. During the fall, the fireplace draws the Haugan family in for quality time and warmth. The kitchen is another key feature of the cottage, particularly since it’s linked to the other living spaces, opening up to the great room, dining room and sunroom. “The homeowners love to entertain and wanted all the spaces to feel connected and to allow for overflow into each space,” Amy says. Hallway to Chic. 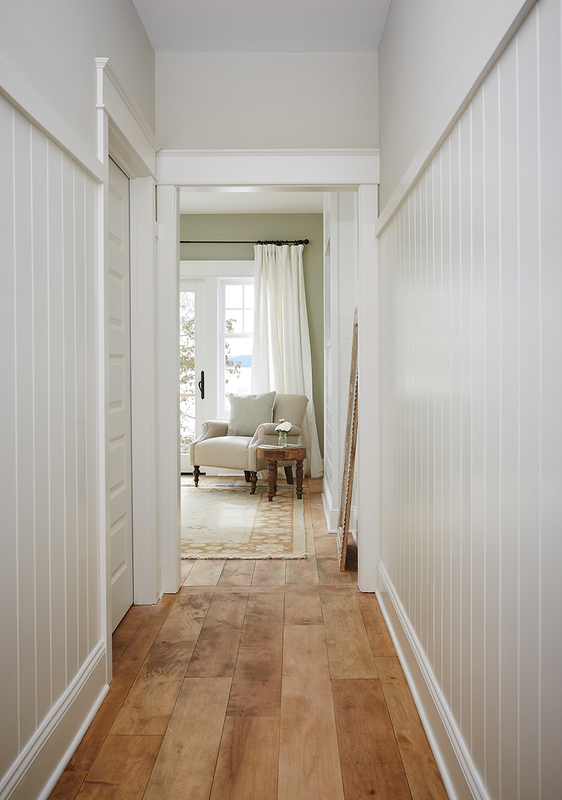 Amy notes that the master hallway was long in design, so she and the homeowners decided on white cottage tongue-and-groove board to add interest. Bar Goals. Amy strategically placed the bar on the other side of the sink, so aspiring mixologists can get to work without interfering with the kitchen. Rustic Rec Room. 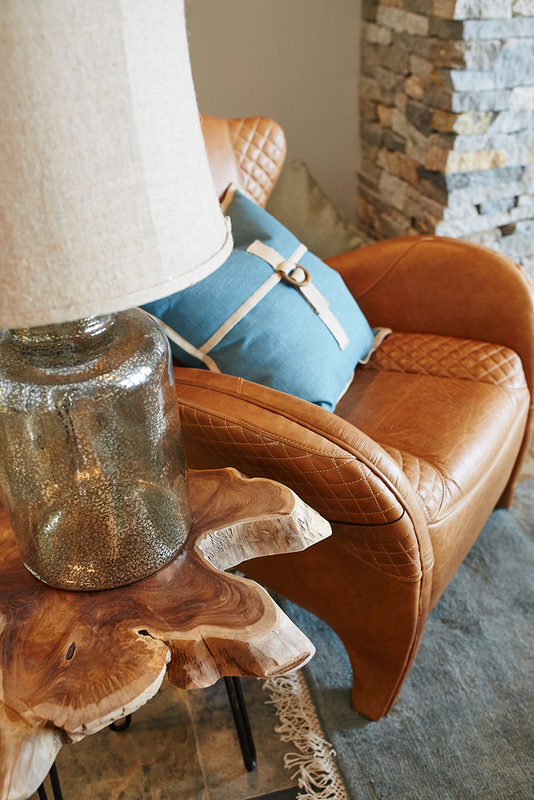 With natural slate floors, leather armchairs and a wood coffee table, the family room has warm tones that give it a down-to-earth feel and make it a place where the homeowners and their children love hanging out. Display Décor. The built-in shelf was created in the design phase and gives the room extra storage and display space for photos, making it both practical and artful. Too Hot to Handle. 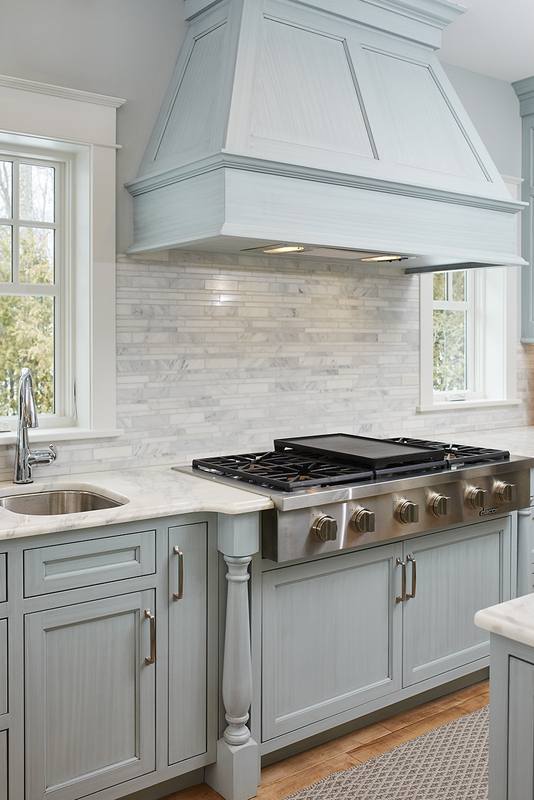 The backsplash and counters are both composed of Calcutta marble, giving the area around the range a sense of height and clean, effortless style. Master [Bedroom] of the House. The soothing hues and style cues were derived from the outdoors. Amy opted for a twist on a nature-inspired interior with more neutral colors, choosing Pottery Barn linens to adorn the Thibaut Custom Furniture bed. In keeping with the soft feel, the kitchen cabinets were painted Benjamin Moore Super White while the walls were painted Bright White. 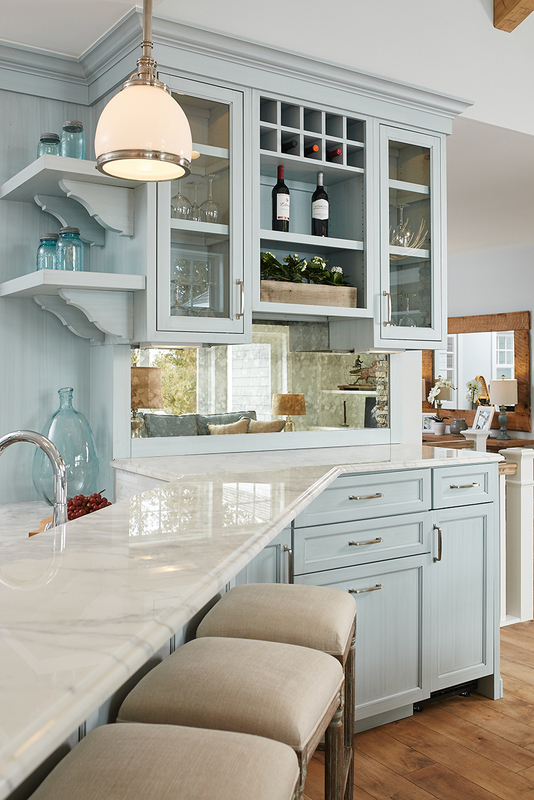 The two hues combine to create a soothing yet chic environment and tie in perfectly with the glossy sheen of the Calcutta marble backsplash and countertops. 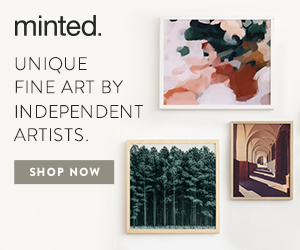 “Both Trudy and I love the feel and look of real marble,” Amy says. Other styling decisions, like the more rustic influence embodied in the sliding wood barn door, naturally stained bookcases and leather armchairs, make the room a great place to cuddle up while the leaves change outside. With Trudy’s knack for cooking, marble countertops were a no-brainer as marble holds cooler temperatures, something that comes in handy when she rolls out cookie dough for instance. She also loves the character and imperfections that come with marble as it ages through the years. Other features, like a large cook top, double ovens, two fridges/freezers and a 50-inch triple sink, were installed specifically for Trudy. 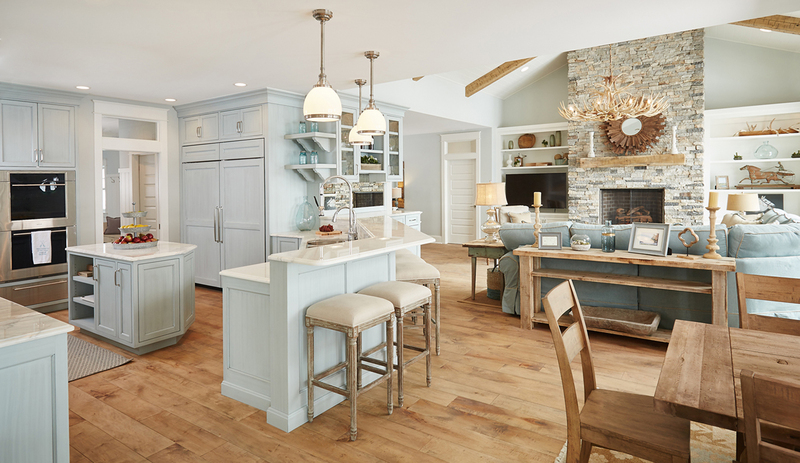 Barstools, placed against the counters, delineate the areas between the kitchen and the other rooms and allow curious observers to sit with mugs of cider and watch her in action. 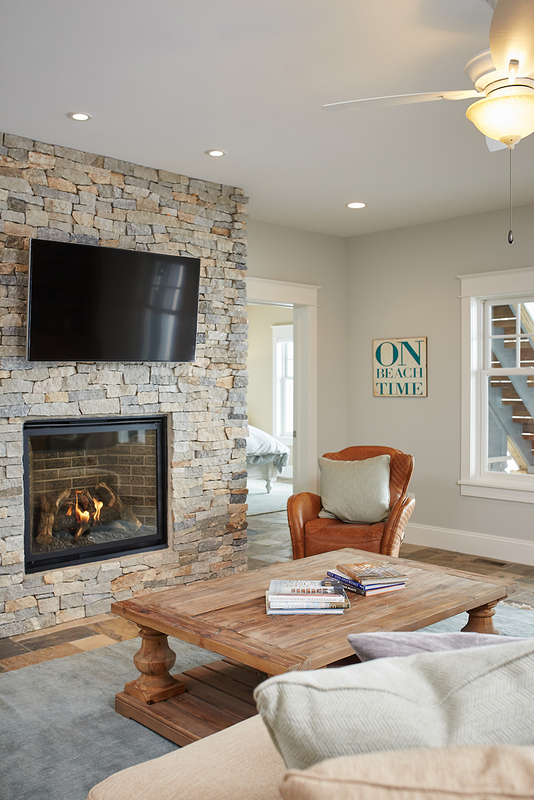 The priorities for the family room were simple and heartfelt: create a place where the family could hang out, even during the chiller months. “The natural slate floor is heated, so it’s always nicely toasty,” Amy says. 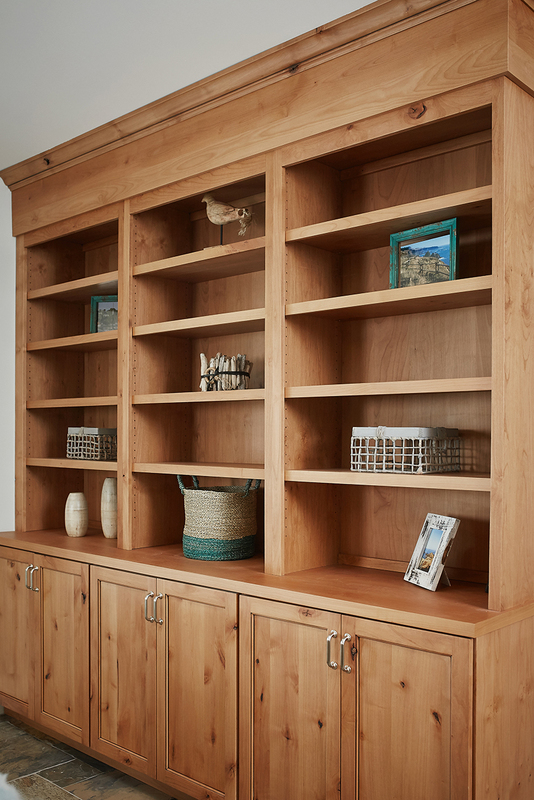 We feel that built-ins are places for storing or displaying cottage memories. I love going into old cottages and looking at what history is being displayed with a built-in shelf. 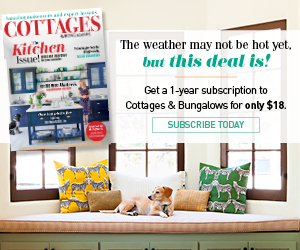 While cottages can typically invoke thoughts of summer, this version of rustic elegance meets beachy chic proves that a little imagination can result in something magical: an all-seasons cottage that wears fall as well as it does summer. Horse and Tack. Trudy selected the armchairs because she rides horses and the quality of the leather reminded her of saddles. 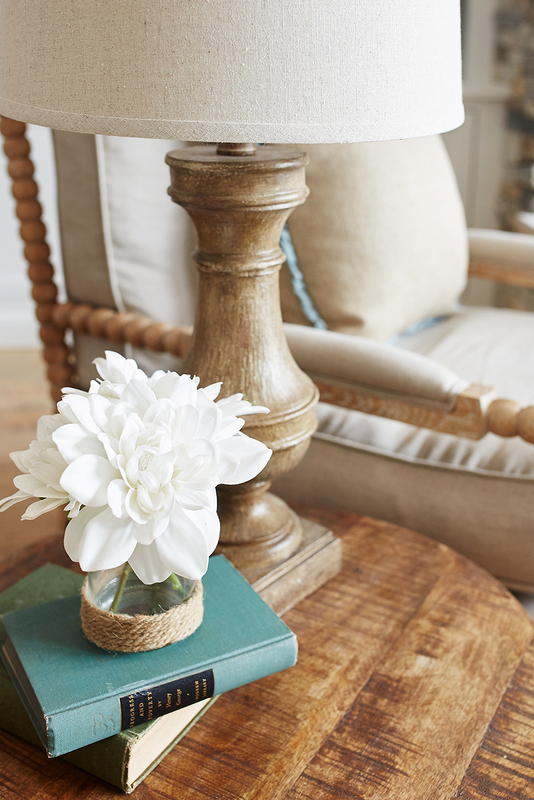 They were a wonderful way to incorporate rustic detailing into the family room. Powder Room Pretty. 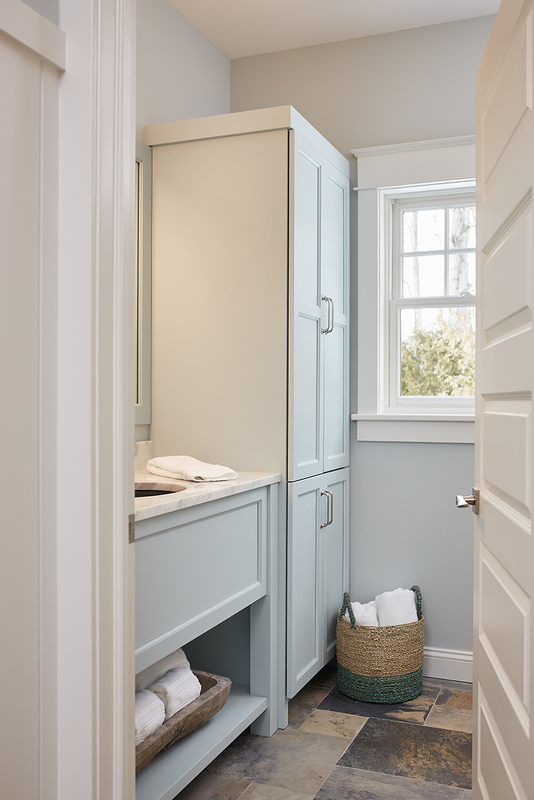 The powder room also has the same airy tonal qualities as the rest of the houses but with a mix of darker floor tiles, which give it its own distinct feel. Stairway Fashions. “The staircase is centered in the middle of the house, towards the front table, and we felt that adding a little artwork would finish the space,” Amy says.